Here we have another photograph from the P Heywood collection it first appeared on the ‘Do you Know’ page but thanks to Spencer we have the following information. The first Bedford OB appeared in the summer of 1939 but production only lasted two months before war broke out and production ceased, in that time Bedford had built seventy three chassis fifty two of which for the UK market. Production of the OB started again after the war the running gear was a six cylinder 3.519 litre petrol engine rated as 28hp with a normal four speed synchromesh gearbox giving 12 miles per gallon on average. In 1945 the cost for a complete twenty seven seat coach was £1314 10s and for a twenty nine seater £1325 10s. Production of the OB finally ceased in 1950 and in that time 12,766 had been built. Tremains operated from Zelah in Cornwall and a had small depot just off the main A30 to the south of the village. The livery was a dark red with cream and this bus (or one very much like it) was a regular on the school bus trips to Goonhavern, where I was a pupil in the early seventies. I’d be interested in a proper print or high res scan of this image. Its difficult to find enough complimentary terms for the OB and the OWB without sounding "over the top" but surely the model must be one of the most big hearted and commendable vehicles in PSV history. I have travelled extensively on both versions and have had the great joy of driving several coaches. I think that the "war medal" must go to the OWB which performed heroic feats of service reliability and economy, often of necessity very heavily overloaded on essential routes. In the West Yorkshire area the notable independent Samuel Ledgard had five OWBs at the small Yeadon Depot and these little heroes maintained two constantly intensely busy services throughout the later days of the Conflict and for many years afterwards. To the enthusiast the mechanical symphony of the little Bedfords was pure joy. After the glorious pure and powerful whining in the first three ratios a kind of almost unreal quiet purr would take care of full speed running in top gear. The occasional but harmless "misfire" would add a little variety to the concert. The suspension was also extremely successful and, combined with the quiet top speed, meant very comfortable journeys for coach passengers. I did confess to a tendency to being perhaps "over the top" and I must in closing mention one particular little hero of my happy acquaintance – during my RAF service at the Patrington radar station on Spurn Point I often travelled to shifts at the underground site in the only OWB allocated there – how I’d love another trip today in wonderful little 00AC52, normally driven by Sam, the only civilian driver at the Station, but occasionally mercilessly flogged but stoically without a whimper by some of the hopeful Formula One RAF drivers. Absolutely Chris. They were like little mice scurrying all over the countryside. Holidays were enhanced by day tours, half-day tours, mystery tours and evening tours. And what was the transport? Nine times out of ten an OB/Duple. One featured in the film "Titfield Thunderbolt" if I remember rightly. I recall them in Penzance, Ilfracombe, Mablethorpe, Dunoon, Keswick and the Isle of Man. Do you remember John Major’s nostalgic dream of warm beer and elderly spinsters riding to evensong on bicycles? Add in a Bedford OB and the picture of Britain in the early 50s is complete – and all is well with the world! I travelled regularly on the stage service of a small operator in Derbyshire who had a couple of OB’s and it occurred to me that these would have been the only petrol engined PSV’s that I ever travelled on. I believe that a small number were fitted with Perkins diesel engines but am I correct in assuming that most of them retained their petrol engines throughout their lives? Did Bedford offer a diesel version from new? 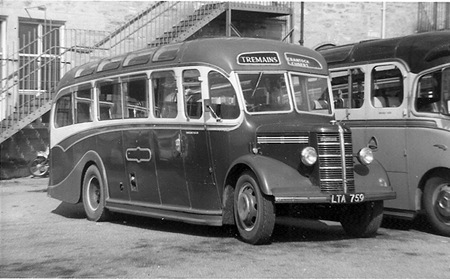 Tremains acquired LTA 759 from Western National in April 1963. The coach is in Truro, on the traditional independent terminus at The Green (nowadays part of the bus station) and would be operating one of Tremain’s bus services; I can’t quite make out the destination but it looks like it might be on the Crantock and Cubert service. Chris B – yes I’m quite sure that you’re right in that most OWBs/OBs were always petrol engined, and I’m pretty sure too that there was no diesel version offered by Bedford. Michael – although I’ve personally never heard of Crantock or Cubert a magnifying glass confirms that your guess is correct and those are the places on the destination blind. Chris Y Crantock and Cubert are both near Newquay, the former now being better known as a surfing paradise! Crantock Bay is where you will need those "baggies", a mean surfboard and a 1955 VW Camper or "Splitty"! I remember it from it’s much quieter days in 1960 when it was just a beautiful beach! Many thanks Richard for that information on the Cornish delights – these days, in my advancing years, its about all I can manage to surf the Net. Also I’ve never actually been to Cornwall, only Devon, and really ought to do so. Although Bedford did not have a Bedford diesel engined version of the OB, some did have a Perkins Diesel engine fitted from new.